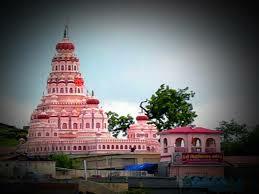 Here is Some Information About Siddhivinayak Temple in Siddhatek Ahmednagar Maharashtra. The Siddhivinayak Temple is located the banks of river Bhima At Siddhatek Town Ahmednagarin Maharashtra.The original temple is believed to be built by Vishnu, however it was destroyed over time. Later, a cowherd is believed to have had a vision of the ancient temple and found the icon of Siddhi-vinayaka.after the new temple was built by Ahilyabai Holkar was the Holkar Queen of the Maratha ruled Malwa kingdom in 1700's.The temple is dedicated to lord Ganesha.The temple is among one of Ashtavinayak Temple in Maharashtra.Shree Siddhivinayak's temple is on a hill top facing north. 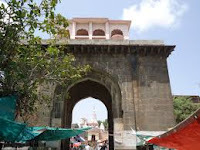 The sanctum of the temple, which is fifteen feet high & ten feet broad was built by Ahilyabai Holkar. The swayambhu idol of Shree Siddhivinayaka is placed in a brass frame. 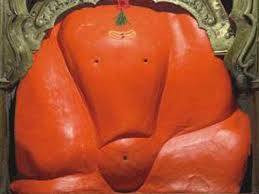 Brass idols of Jay & Vijay are placed on both sides of Siddhivinayaka. 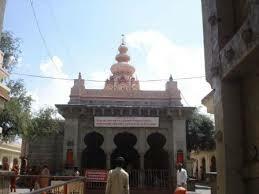 In the sanctum itself there is a Shivapanchayatan & goddess Shivai's small temple. The hall of the temple was previously built by Baroda's landlord late Shri Mairal. It was broken in 1939 & was rebuilt by Ganesh's devotees in 1970. The Ganesha Idol is 3 Feet tall and make black stone.The sanctum sanctorum of the temple stands at a height of 15 feet and 10 feet wide. The sanctum sanctorum has the presence of Jaya and Vijaya, the two demigod Dvarapala (gatekeepers) of the abode of Lord Vishnu, sculptured with brass.The Siddhivinayak temple is constructed using black stone and the temple faces towards the north direction.The specific feature of the temple is that the doorway of the main temple contains a small diabolic head sculpture.The temple contains a special image of Shiva-Panchayatana, the worship of five deities, where the idol of Lord Shiva is surround by Lord Ganesha, Lord Vishnu, Goddess Devi and the Sun god Surya. About the temple history is believed that the site was known as a place where Lord Vishnu performed penance to get a boon from Lord Siddheshwar Ganesh. Sage Moraya Gosavi from Chinchwad and Sage Narayan Maharaj from Kodgaon completed their penance and got siddhi from Lord Siddhivinayak at this place.Long ago, Deity Brahma thought of creating Nature and for that, he ceaselessly chanted the mantra "OM". Ganesha was delighted with the penance and gave him the boon that he will fulfill the wish of creating Nature. When Deity Brahma was creating Nature, Vishnu fell asleep. Demons Madhu and Kaitabh emerged from Vishnu's ears. They started harassing all the Gods and Goddesses. Deity Brahma realised that only Vishnu will be able to annihilate these demons. Vishnu tried his very best to kill them, but failed. He then stopped the battle and took the form of Gaankushal Gandharva and began singing. Shiva when he heard the celestial notes of the Gandharva, summoned him. Vishnu then told Lord Shiva about his unfinished battle. Shiva told him thatsince he had not sought the blessings of Ganesh his task had remained unfinished. Shiva asked Vishnu to recite the Shadakshar mantra (Ganeshaya Namah) and in order to achieve what he wanted. Vishnu choose the Siddhkshetra to complete the ritual of propitiating Ganesh. Ganesh granted Him his wish. Vishnu then created a four-door temple on the hillock and installed the statue of Gajanan. Since Vishnu achieved siddhi here, Ganesh was called the Siddhivinayak and the place was called Siddhatek or Siddhkshetra.Deity Brahma got the energy to create Nature with Ganesh's boon. Lord Ganesh accepted the two daughters of Lord Brahma as his wives. In time, the temple created by Vishnu perished. It is believed that a shepherd saw Ganesh here and started worshipping Him. He then found a priest to conduct the worship and ultimately it was during the rule of the Peshwas sometime that the present temple was erected. 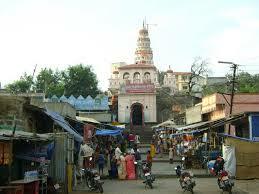 The Siddhivinayak Temple is along the Bhima River which flows southwards. One remarkable thing about the river is that however rapid its flow, it does not make any sound while flowing. By Road : There are many Private and public vehecals available to reach Siddhivinayak Temple in Siddhatek.State transport buses stop at Shirapur, 1 km prior to Siddhatek. By walking down a distance of 1 km from Shirapur you come across river Bhima. On crossing river Bhima by boat you reach Siddhatek. 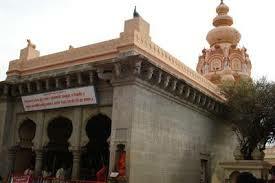 By Rail : The Nearest Railway station is Daund Station from 18 Km of Siddhivinayak Temple Siddhatek. By Air : The Nearest Airport is Pune Lohegaon Airport . This nice and amazing post.